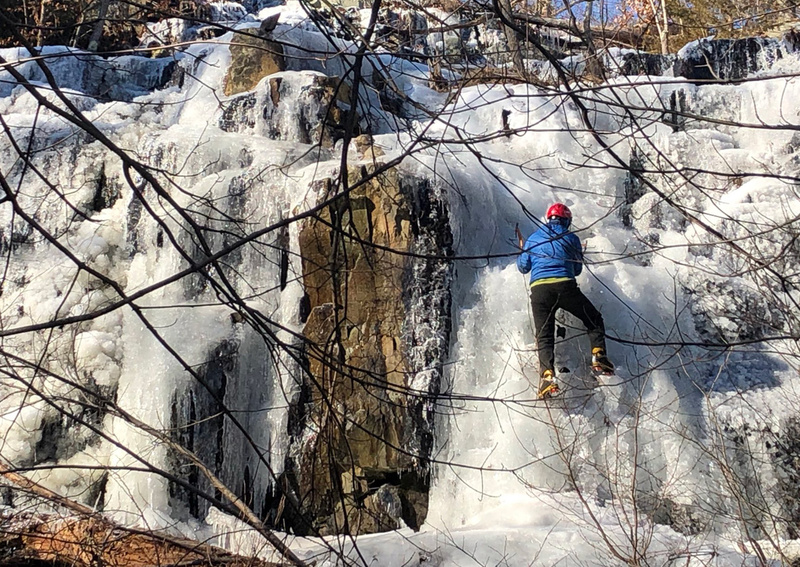 Marc Hurwitz spotted somebody climbing up a still frozen waterfall in the Middlesex Fells today. He had a one-word reaction: "NOPE." Lori Magno snapped a photo of a couple of baby-faced new Orange Line cars resting with some of their older, wearier counterparts at Wellington this morning. Medford Police report a black bear has been visiting the Lincoln Street area for at least a month, but that nobody notified authorities until 2:45 a.m. today, when a resident at 114 Lincoln Rd. called 911 to report a "medium sized bear" making quite a commotion in the area where the resident keeps trash. Read more. Lisa Gualtieri photographically captured this freedom-seeking pachyderm this morning. 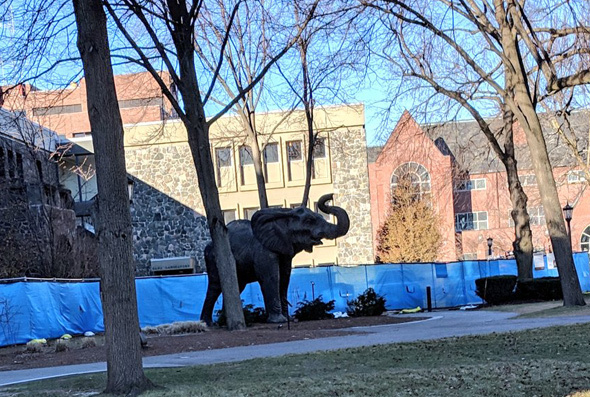 It is, of course, a statue of the college mascot, Jumbo, looking like he's making a run for it because of some construction fencing behind him. Read more. The Tufts Observer recounts the university's long history of taking opium-linked money, from donations from a member of the Cabot family to the building named after the couple who gave us OxyContin. 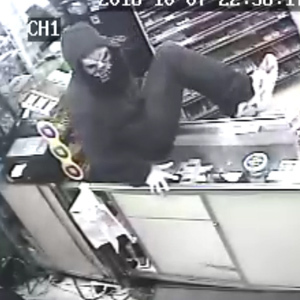 Medford Police have released photos of a masked man they say robbed the Shop & Go convenience store on Salem Street of Black and Mild cigarillos on Oct. 7. Read more. But this time they really, really mean it, and before you know it, people will be riding the Green Line hard from Union Square and other points west of Lechmere, they say. Greg Cook covered cardboard-canoe races in Medford yesterday. Signal problems at Wellington are jamming up Orange Line platforms as trains slow to a crawl. David Christopher reports he's at Wellington, where he watched helplessly as two completely full trains pulled in and then left, with no room for anybody to get on. Lisa Angelo spotted those two new Orange Line cars out for a spin on the third set of tracks near Wellington station this morning as they undergo several months of testing. 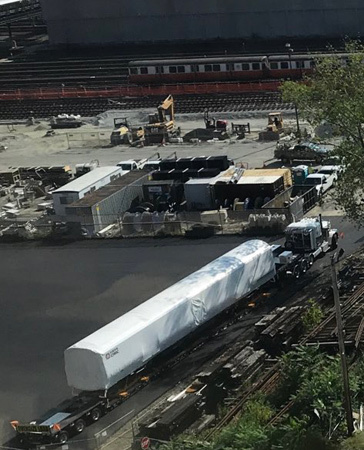 Meanwhile, the T reports the CRRC plant in Springfield has accepted four new Orange Line "shells" for assembly into actual Orange Line cars: Read more. Marc Hurwitz reports all that melting snow meant lots of waterfall action in the Middlesex Fells today.